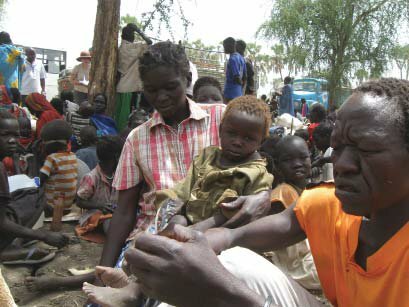 A Sudanese man (right) in Upper Nile grieves the loss of his two daughters after an airstrike on his town in Blue Nile, Sudan (UNHCR). South Sudan and Sudan creating a demilitarized border zone is welcome news. But it must be followed quickly by more action. Lives depend on it. There is tremendous suffering among innocent civilians from this conflict, particularly in South Kordofan and Blue Nile states in Sudan. There Sudan’s army is fighting rebels who sided with South Sudan during years of civil war. Many thousands are starving; some trying to live on roots and leaves from the forest. Sudan won’t allow the UN World Food Programme to bring aid to parts of these states not under their control. Earlier this year Save the Children-Sweden screened about 17,000 small children in South Kordofan and found that over 2000 of them had either severe or moderate malnutrition. The lack of nutrition can cause lasting physical or mental damage. Some civilians are fleeing Blue Nile and South Kordofan to refugee camps across the border in South Sudan. Just recently a group of nearly 900 refugees, including 175 children, walked for five days escaping shelling and aerial attacks in their village in Blue Nile. Four died during the journey from exhaustion and others had to be left behind. Even for those who reach the refugee camps the struggles are not over. There is the risk of disease. The refugee overflow has caused great strain on the impoverished host community. In some cases this has led to fighting, including cattle raids. Aid agencies also need funding to continue to feed and shelter the war victims. There is such great humanitarian needs even aside from those caused by the conflicts. Drought and long-standing poverty also take their toll, leaving many children malnourished. Internal conflict in South Sudan, many times over scarce resources, make this crisis even worse. Roads are so bad that aid agencies have to station food at strategic points before they become impassable during the rainy season. South Sudan’s only hope for overcoming these challenges rests with its children. The UN World Food Programme (WFP) is helping to build that future with school meals. This depends though on voluntary funding from governments and the public. The more resources committed to war the less for building the future. Amor Alogro of WFP says the agency fed 560,261 schoolchildren in Darfur during January and hopes to continue this for the rest of the year. WFP depends on voluntary funding for its operations but its school feeding is short of about $US 33 million dollars. In South Sudan WFP officer George Fominyen says the agency is going to feed 424,000 children with school meals plus an additional 40,000 girls will receive take-home rations. WFP provides the meals in the areas where hunger is greatest but they cannot reach all hungry children. The goal is for South Sudan to build a national school feeding program, a difficult task given the constant setbacks from drought and conflict. Sudan and South Sudan cannot advance their society through endless war and military expense. There is massive distrust between the states, which is not going away any time soon. The new demilitarized zone, once fully implemented, is at least a ray of hope. We know from our own history that sometimes these agreements can help build peace. The Rush-Bagot agreement disarmed British and American warships on the Great Lakes following years of warfare and when border disputes from Maine to Oregon still existed. South Sudan and Sudan need to realize that the swords have to be dropped and disputes resolved at the conference table rather than on the battlefield. Article first published as Civilians Suffering from Conflict Between Sudan and South Sudan on Blogcritics.